Barneys Farm - Critical Kush. Free US delivery. Critical Kush was bred by crossing the Mr. Nice strain Critical Mass with OG Kush. It is a 100% indica strain with amazing hybrid vigour, high yields and great potency. As a regular (i.e. non-feminised) version it is a very reliable way in which to obtain mother plants which will provide cuttings for a long period of time. 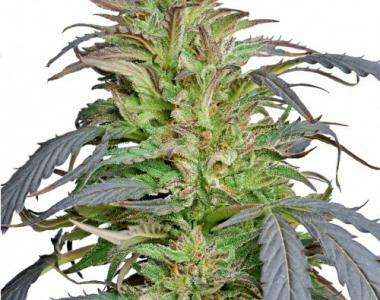 Critical Kush reaches a height of around 100 - 110 cm. but such is the weight of its colas that its side-branches will more than likely need some form of support to prevent bending and/or snapping. Although it grows very well indoors its short flowering period makes it eminently suitable for outdoor cultivation. Each plant can produce between 700 - 800 gr. of buds with a high density and packed with loads of resin. Indoors flowering will last for 50 - 60 days while outdoor crops in the northern hemisphere will be ready in the latter half of September. The taste of the dried buds is pure Kush and the high is potent while at the same time being very relaxing. One for the connoisseur as well as for the more commercially minded and a strain with medicinal value.